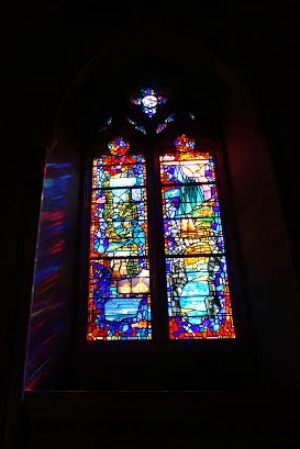 I was shocked when I learned that it now costs $10 to enter Washington National Cathedral, unless of course you were going there for a church service. Since the last time I had been there, 20 years ago, admission had been free, and since I can't remember the last time I had to pay to get into an American church, it was indeed a shock. However, I quickly learned that the cathedral had to start charging admission due to significant damage it suffered after the 2011 earthquake. Somewhat mollified, and wanting my kids to see the cathedral, we decided to plan the trip despite the cost. We were glad we did. I think you'll be glad to pay the admission fee as well as long as you remember two important things: first, that your admission fee is going to repair this beautiful building, and second, that while this church is certainly beautiful and historic, it is really more of a an homage to all faiths rather than an Evangelical church (witness the many books on Buddhism, Islam, etc. in the bookstore). 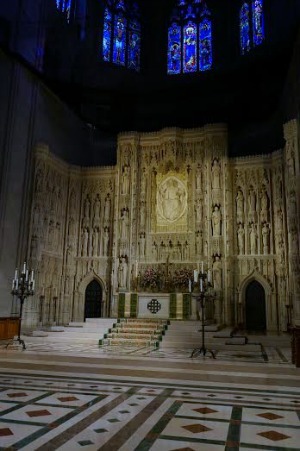 In that way, unlike most practicing American churches, Washington National Cathedral is very similar to European churches: a shell of what it once was and more of a museum than anything. Below, you'll find what you should not miss at the museum, recommended things for kids to see, information on hours and parking, and a great restaurant nearby. Originally called the cathedral church of St. Peter and St. Paul, the cathedral's foundation stone was put down in 1907 (attended by Pres. Teddy Roosevelt) but not completed until 83 years later in 1991. Built of Indiana limestone, the cross-shaped building is the 6th-largest cathedral in the world. Fans of Gothic architecture (and especially those who appreciate things like "flying buttresses") will enjoy the ribbed vaulting, naves, and other things most people can't pronounce but find pretty anyway. 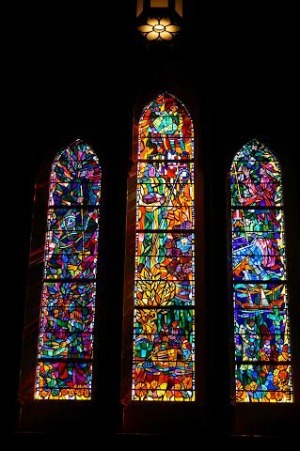 Speaking of pretty-- actually, beautiful-- the cathedral may be best known for its truly spectacular stained glass windows. Certain times of the day the light shining through them casts rainbow-hued shadows against the stone walls. It's breathtaking. 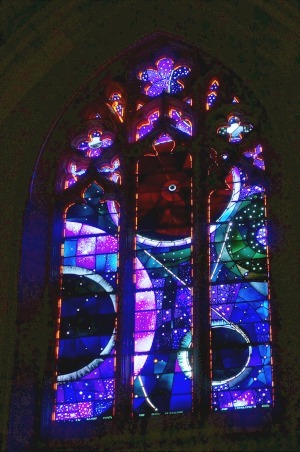 The space window, created in memory of the Apollo 11 mission to the Moon, whose centerpiece is a piece of Moon rock brought back by the crew. The Darth Vader grotesque (I'd call it a gargoyle) one of many unusual formations that can be seen on the outside of the cathedral. Be sure to bring binoculars in order to be able to see this and a number of other strange-looking grotesques. The Crypt - interesting because it is a quiet basement level which kids may find interesting to explore, as well as the burial place of President Woodrow Wilson. The program observation gallery, accessed by elevator, where you can get great views of the city and see an exhibit on some of the damage caused by the earthquake. Three rose windows (the likes of which you usually don't see outside of Europe). Washington National Cathedral is located at 3101 Wisconsin Ave in Northwest Washington DC. Admission is $10 for adults, $6 for kids 5-12, seniors, students, or military. Children under 4 can get in free but the cathedral is not really their speed. If you go on a Sunday or for worship, prayer, or for other spiritual purposes you can get in free. So what does your $10 get you? We went off-season the first week in February, so we pretty much had the cathedral to ourselves. Your $10 only gets your self-guided tour with a decent brochure, but we were able to tag along with a private tour where we were able to learn a number things in detail. They also offer a number of special tours (such as their Gargoyle tour) which are available at an extra charge (most are about $15 per person). 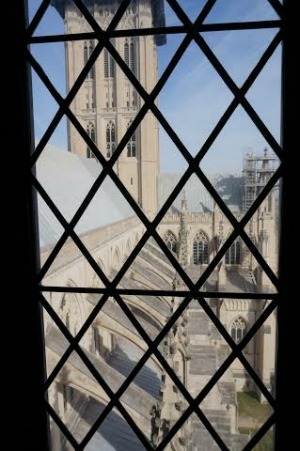 For details on these and other visitor info on the cathedral, click here. Since you're highly unlikely to get street parking, parking is available in an underground garage. Enter from Wisconsin Ave at the traffic signal just south of Woodley Road. Prices range from $6 for the first hour on weekdays (they roughly double for the second and third hours), so it's cheaper to visit on Saturdays ($9 per hour flat rate) or on Sundays, when you'll pay $0 to attend services. Washington Cathedral has a new cafe in the nearby Baptistry which is open daily for breakfast and lunch. I haven't tried it, but there are a few restaurants with in a few blocks of the cathedral. I recommend Café Deluxe, located at 3228 Wisconsin Ave. My husband loved his bison burger and my kids raved about the chicken pot pie and cheeseburger. That makes Cafe Deluxe sound more basic than it is, but you can find everything from the above to fancier fare like flatbreads with apple, brie and candied walnuts, to Croque Monsieur. Plan on $10-$15 for burgers and sandwiches and up to $20 for fancier entrées. Looking for more things to do in Washington DC?